Home of the world’s worst traffic jams, Moscow has launched a massive effort to clear the roads, introducing paid parking and raising costs for car ownership. Moscow has launched an ambitious, multi-billion dollar campaign to unsnarl its notorious traffic jams, a gargantuan task in a city ranked as the world’s most-gridlocked. Moscow aims to transform itself by 2020 through spending a total of 2.9 trillion rubles ($62 billion) and doubling down on public transportation, in a series of projects initiated by Moscow Mayor Sergei Sobyanin. Meanwhile, a paid-parking regime and expanded toll roads will increase the cost of car ownership. Amid signs of early progress, skeptics say success can only come in degrees. “Even if you spent the entire budget of the Pentagon [on improving Moscow’s roads], you couldn’t solve the problem,” says Mikhail Blinkin, director of the Institute for Transport Economics and Transport Policy Studies. The city’s twisted streets and centuries-old layout mean that “Moscow can’t be a city for cars,” Mr. Blinkin says. The plan, which includes suburban rail development, road construction and even creating 300 kilometers of bike lanes, aims to save drivers 88 hours a year, according to Deputy Mayor Maxim Liksutov. At the top of the mayor’s action plan: Getting muscovites to park in approved spaces, instead of simply pulling their cars up on to the sidewalk or double-parking in the road. The latter creates an acute problem by tightening the city’s circulation into random bottlenecks. To fix the parking issue, city officials dispatched a fleet of little green tow trucks, which quickly became notorious for making off with inappropriately parked cars. The plan also foresees an expansion of the Moscow metro, boosting the the number of stations by 78 to 250, and placing 93% of Moscow’s residents within walking distance of a metro line. Moscow is ranked as the world’s most gridlocked metropolis, ahead of Istanbul, Rio de Janeiro and Mexico City, according to road navigation company’s TomTom’s 2014 yearly traffic report. The roots of the problem stretch back into the Cold War years. Under the Soviet Union, deficiencies in the socialist economy made cars a luxury item. That left Moscow’s centuries-old byways largely uncongested and meant that city planners had no need to worry about traffic. When the Soviet system collapsed in the early 1990s, the pent-up demand for automobiles was unleashed. As Russian incomes grew, car ownership exploded and Russia emerged as one of Europe’s top five auto markets. Young Russians, whose parents and grandparents had never even dreamed of owning a car, enthusiastically embraced this new symbol of wealth. In 2014, Moscow’s official population of 11.5 million was driving at least four million cars, according to the Interior Ministry’s count. Some experts argue that Moscow was simply never designed for this many cars. Unlike the orderly grids of New York or Chicago, Moscow converges all transport options into the business-heavy city center. “Just look at [the roads] on Google maps – it’s like an asterisk,” says Mr. Blinkin. 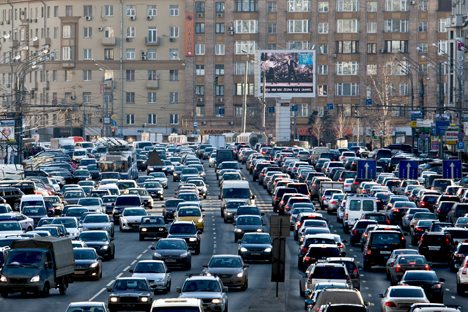 Yet even as Moscow grapples with its existing traffic problem, its population growth may only make the challenge even more difficult going forward. The city estimates that Moscow may grow to 15 million by 2025, and illegal immigration from Central Asia means that the real population may be much higher. Mr. Blinkin notes that progress will depend in part on the city’s commitment to spending in the face of economic uncertainties. In the meantime, notes Alisher Budtobaev, a Moscow taxi driver, the construction connected with the upgrade has actually made traffic worse in many places. “As soon as the construction ends, I expect it’ll become gradually better,” he says. Millions of Russian commuters — along with city officials — all hope that he’s right.